Taxes are done! Taxes are done! Taxes are done! Now they go to the accountant and (::crosses fingers::) he’ll review everything and tell me my estimated quarterly payments were enough. I promise that this week I will answer the extremely good questions about the writing process sent in by a bunch of you guys. The rest of the weekend is devoted to some work for Editor #1 and a phone call with Editor #2 to discuss the draft I sent her last week. Before I dive back into my source notes and scribble madly, a few concluding pics from Chattanooga, TN, plus a gorgeous picture from the hinterlands. The morning I left, I stopped at Hixson High School…. and did Laurie put all of the students to sleep? When you suspect you are a little crazy, it’s nice to have company. Yesterday BH & I ran in the 4th Annual Chilly Chili 5K Race in Cazenovia, NY. When we started running 18 months ago, 5 kilometers (3.1 miles) seemed an impossible distance to cover. Now that we’re training for the half-marathon (13.1 miles) it’s a piece of cake. A snowstorm blew in at the beginning of the race yesterday. A wicked storm. The temperature was around 18 degrees, but the winds were gusting 20 – 30 mph, which made for a wind chill just below zero degrees(F). It was snowing sideways. The road was covered with slippery, scary snow and ice. And nearly 1,000 people ran, shuffled, and walked the distance. Finishing a race under those conditions is a lot like completing a book on deadline: it’s not very pretty, but the sense of accomplishment is huge. Even if your face is frozen. I don’t know if you can see it in the photo, but the ice on my face is frozen sweat. The rest of me was toasty warm, thanks so several layers of warm running gear, but the face was a little ouchy. The whole point to completing this race is the party afterwards. 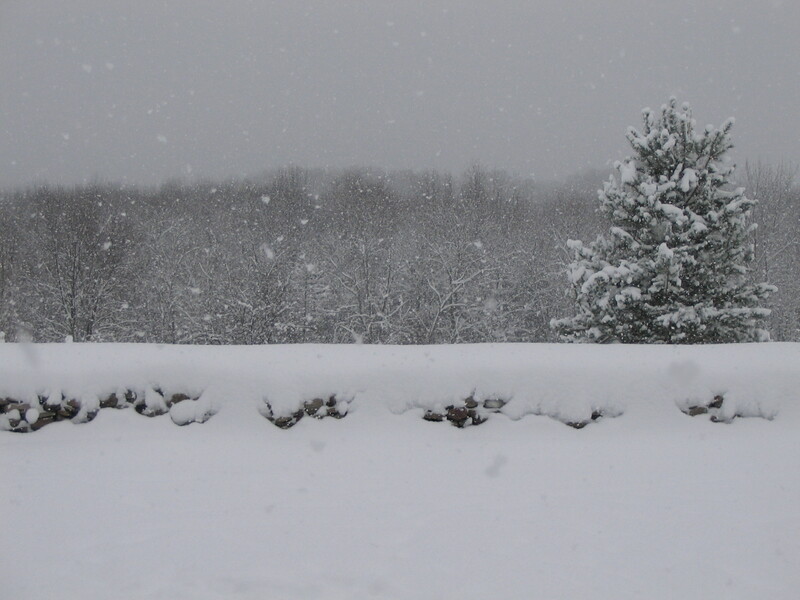 The snow stopped, so our lake effect storm was a brief one (compared to last February). We wound up with almost four feet, but the driveway is plowed, the streets are plowed, we were able to get out yesterday afternoon. Oh, and school is open today. In Fulton, NY, (a few towns over) the roof on the Department of Public Works garage collapsed under the weight of the snow. CNN is covering it. Sure would be nice if CNN would come back up here for the apple harvest, or the perfect summer nights when we can see the Milky Way from our back yard. An interesting question about being a professional writer turned up in the comments section a few days ago. wrote: I love how you write about the writing process in your journal. I’ve only found this journal a little while ago, but I’m been following the entries, and as a writer, it’s really something I can relate to. Writing is so unpredictable and since I’m still just a young wannabe (I’d like to think I’m a writer, even if not a professional one), I can’t even believe how professional writers can put writing’s unpredictableness aside and meet their deadlines! Care to enlighten me? By “unpredictableness” I assume you mean that we rarely feel totally inspired every single day. I sure as heck don’t. But I have to write every day. First and foremost because I like it and it is good for me. Second, because by staying in touch with the story every day, the writing flows better. Third (though this one is pretty important, too), the writing pays my bills. Any career in the arts has a simple truth attached to it: you have to do the work every day. That is how you get better. It doesn’t matter how many books I’ve published. I have never before written the book I am writing now. I have to respect the work and keep striving to learn more, keep searching for new tools for my work chest. If you are standing on the outside looking in, it might seem a little boring, and I admit, there are days when I long for a job that has a guaranteed paycheck every two weeks and some kind of health insurance, but the truth is, I feel incredibly blessed to be able to write stories that people want to read. That is extremely motivating. Only 49 weeks to go!